A lot of players on the market have built successful MapReduce workflows to daily process terabytes of historical data. But who wants to wait 24h to get updated analytics? A lot of players on the market have built successful MapReduce workflows to daily process terabytes of historical data. But who wants to wait 24h to get updated analytics? 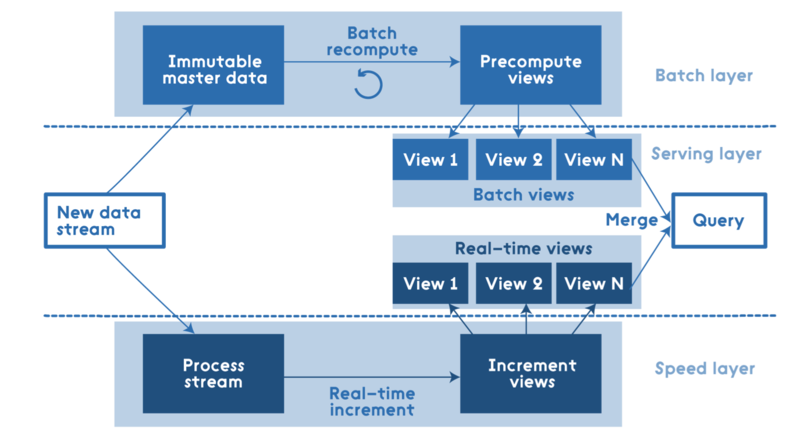 This blog post will introduce you to the Lambda Architecture designed to take advantages of both batch and streaming processing methods. So we will leverage fast access to historical data with real-time streaming data using Apache Spark (Core, SQL, Streaming), Apache Parquet, Twitter Stream, etc. Clear code plus intuitive demo are also included! Apache Hadoop's rich history started in ~2002. Hadoop was created by Doug Cutting, the creator of Apache Lucene, a widely used text search library. Hadoop has its origins in Apache Nutch, an open source web search engine, itself a part of the Lucene project. It became an independent project ~10 years ago. Business realities have changed, so now making decisions faster is more valuable. In addition to that, technologies have evolved too. Kafka, Storm, Trident, Samza, Spark, Flink, Parquet, Avro, Cloud providers, etc. are known buzzwords that are widely adopted both by engineers and businesses. That looks quite ok, but it is still a traditional batch processing with all the known drawbacks, main of them is stale data for end-users since batch processing usually takes a lot of time to complete while new data is constantly entering into a system. Nathan Marz came up with the term Lambda Architecture for generic, scalable and fault-tolerant data processing architecture. It is data-processing architecture designed to handle massive quantities of data by taking advantage of both batch and stream processing methods. I strongly recommend reading Nathan Marz book as it gives a complete representation of Lambda Architecture from an original source. All data entering the system is dispatched to both the batch layer and the speed layer for processing. The batch layer manages the master dataset (an immutable, append-only set of raw data) and pre-computes the batch views. The serving layer indexes the batch views so that they can be queried in ad-hoc with low-latency. The speed layer deals with recent data only. Any incoming query has to be answered by merging results from batch views and real-time views. As it was mentioned earlier, any incoming query has to be answered by merging results from batch views and real-time views, so those views need to be mergeable. 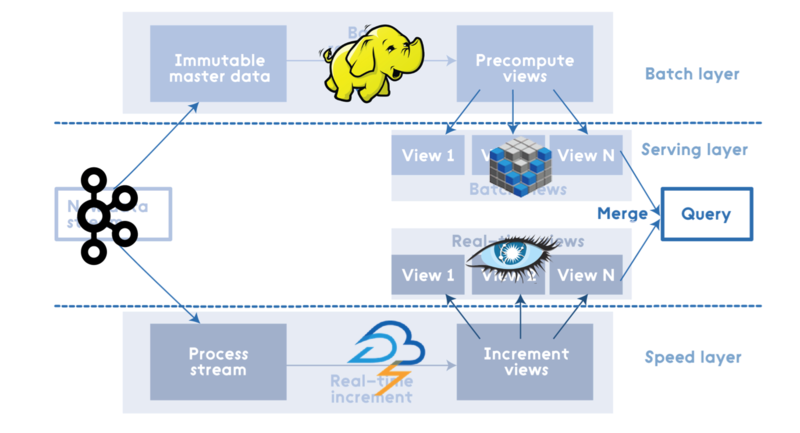 One point to notice here, a real-time view is a function of a previous real-time view and delta of new data so that an incremental algorithm can be used there. A batch view is a function of all data, so a recomputation algorithm should be used there. 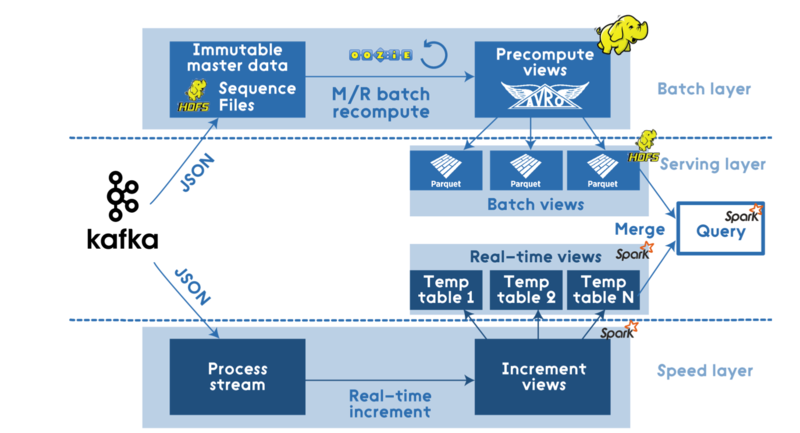 Lambda Architecture works well with additive algorithms. Thus this is another case we need to consider using approximation algorithms, for instance, HyperLogLog for a count-distinct problem, etc. 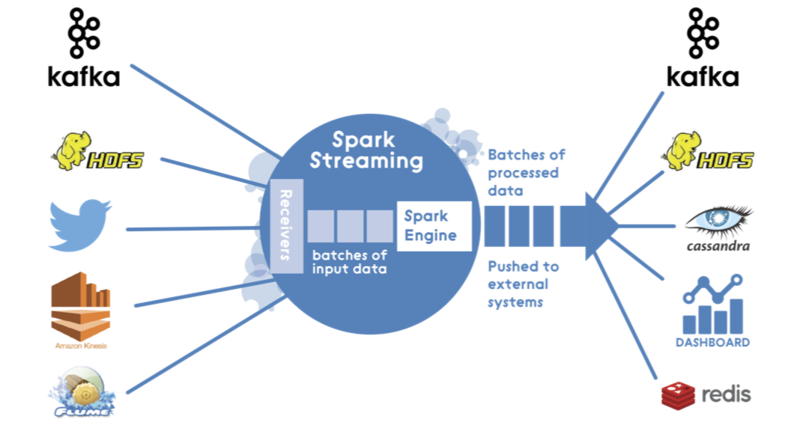 Apache Spark can be considered as an integrated solution for processing on all Lambda Architecture layers. It contains Spark Core that includes high-level API and an optimized engine that supports general execution graphs, Spark SQL for SQL and structured data processing, and Spark Streaming that enables scalable, high-throughput, fault-tolerant stream processing of live data streams. Definitely, batch processing using Spark might be quite expensive and might not fit for all scenarios and data volumes, but, other than that, it is a decent match for Lambda Architecture implementation. Let's create a sample application with some shortcuts to demonstrate Lambda Architecture. The main goal is to provide hashtags statistics used in the #morningatlohika tweets (that is the local tech talks I lead in Lviv, Ukraine): all time till today + right now. A source code is on GitHub, more visual information about the mentioned topic is on Slideshare. Numbers are quite easy to remember as I just used a number of letters in the appropriate hashtags for simplicity. So for a streaming application, I was using DStream connected to Twitter using TwitterUtils:. On each micro-batch (using configurable batch interval) I was performing a calculation of hashtags statistics in new tweets and updating the state of a real-time view using updateStateByKey() stateful transformation. For simplicity, a real-time view is stored in memory using a temp table.